LYNN BOSKELL : Wondeful!. 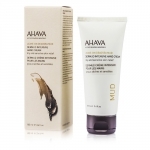 Thank you for bring AHAVA to your range. My wife has tried just about every hand c ream around.....this is her absolute favourite.